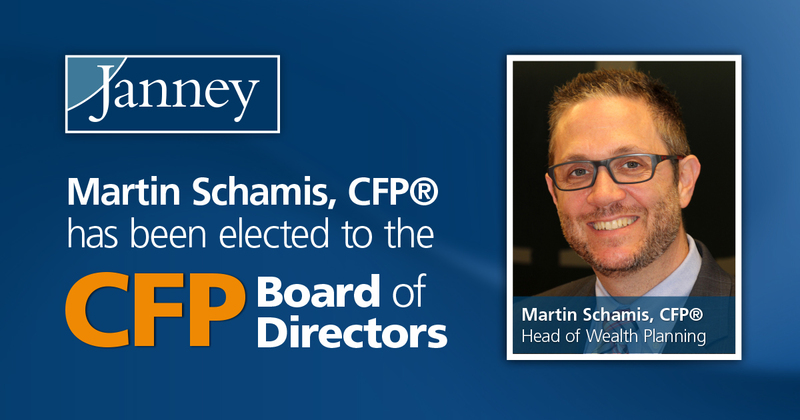 PHILADELPHIA, PA – December 5, 2017 – Janney Montgomery Scott LLC (“Janney”), a leading full-service wealth management, capital markets, and asset management firm headquartered in Philadelphia, PA, is happy to announce that Janney’s Vice President and Head of Wealth Planning, Martin Schamis, CFP®, was elected to The Board of Directors for the Certified Financial Planner Board of Standards, Inc. Schamis term begins on January 1, 2018. At Janney, Schamis is responsible for leading the overall strategic direction of financial planning services for the firm's retail clients, and is an innovator in developing ways to integrate technology into Janney’s financial planning practices. Throughout his professional career, he has led initiatives to improve and manage processes, policies, and procedures to achieve business goals. He has also been affiliated with The Vanguard Group and Morgan Stanley prior to joining Janney. He earned his BA in Physics and Art from University of Delaware, his MBA in Finance from St. Joseph's University, and is currently working on his PhD in Financial Planning from the American College. He earned the CFP® certification in 2003. About Janney Montgomery Scott LLC: Janney provides advice to individual, corporate, and institutional clients. Our expertise includes guidance about asset management, corporate and public finance, equity and fixed income investing, equity research, institutional equity and fixed income sales and trading, investment strategy, financial planning, mergers and acquisitions, public and private capital raising, portfolio management, retirement and income planning, and wealth management. Janney is an independently-operated subsidiary of The Penn Mutual Life Insurance Company and is a member of the Financial Industry Regulatory Authority (FINRA), and Securities Investor Protection Corporation (SIPC). Additional company information is available at www.janney.com. About CFP: The mission of Certified Financial Planner Board of Standards, Inc. is to benefit the public by granting the CFP® certification and upholding it as the recognized standard of excellence for competent and ethical personal financial planning. The Board of Directors, in furthering CFP Board's mission, acts on behalf of the public, CFP® professionals and other stakeholders. CFP Board owns the certification marks CFP®, Certified Financial Planner™, CFP® (with plaque design) and CFP® (with flame design) in the U.S., which it awards to individuals who successfully complete CFP Board's initial and ongoing certification requirements. CFP Board currently authorizes nearly 80,000 individuals to use these marks in the U.S.